You only have one more week to catch the striking revival of Pacific Overtures at Chromolume Theatre (playing through December 17th) and true Sondheim fans shouldn’t pass up the opportunity. 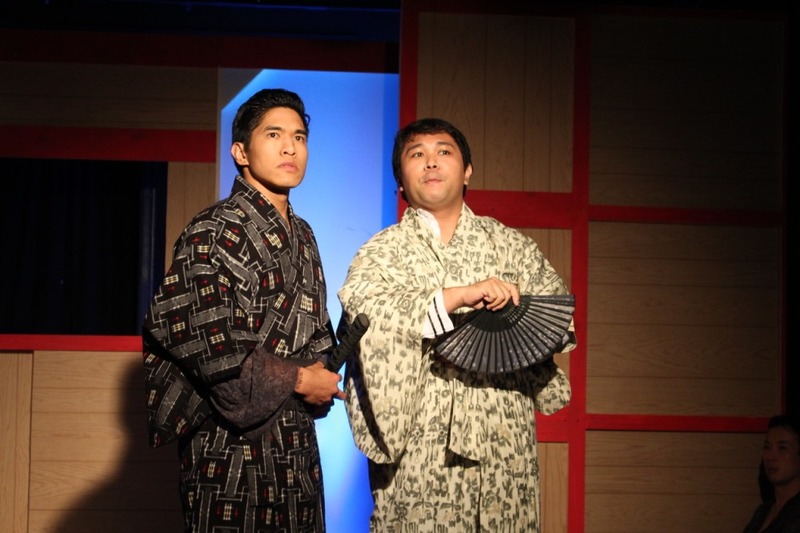 The last time it made an appearance in Los Angeles was in 1998 when East West Players presented it in the company’s new 240-seat David Henry Hwang Theatre. Chromolume’s theater seats only 49 but the production comes alive in this intimate space, achieving a gentle lyricism and uncluttered style under James Esposito’s direction that gives the musical’s emotional impact surprising weight. 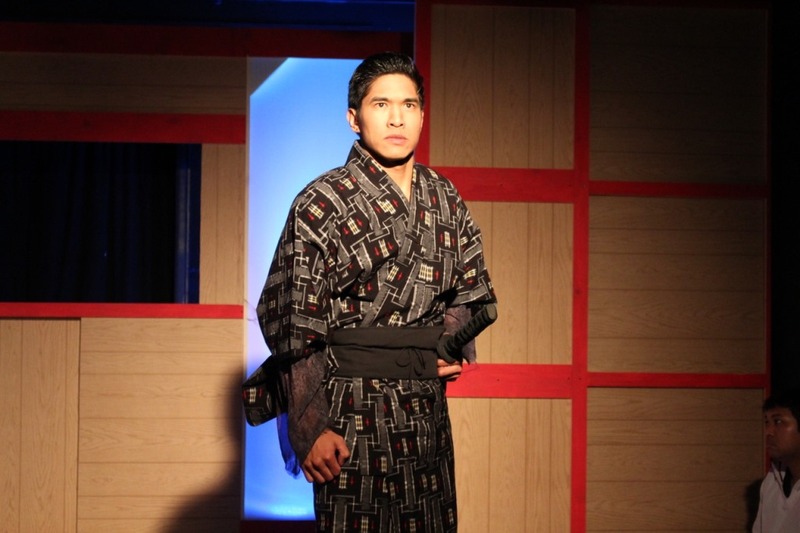 It is performed in a modified Kabuki tradition without the highly-stylized makeup and costumes but incorporating many of the form’s dramatic aspects and enhanced sensory elements. 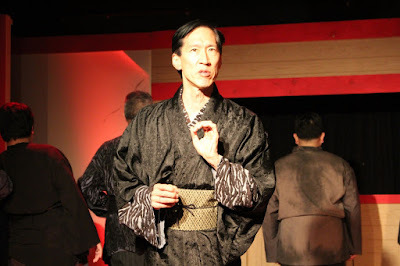 Choreographer Michael Marchuk beautifully tailors the movement to the small playing area. 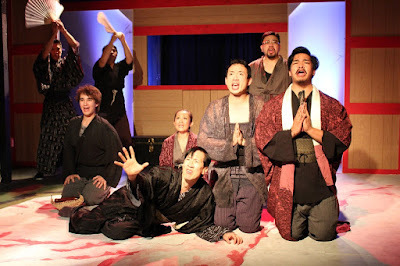 The cast, led by a mesmerizing Paul Wong as the Reciter (or narrator), handsomely communicates the subtleties in John Weidman’s book and Sondheim’s score but what is even more potent is how alive their silence is. The visual organization has a distinct presence and you can feel it shift as the tone changes from scene to scene. Focus is all. 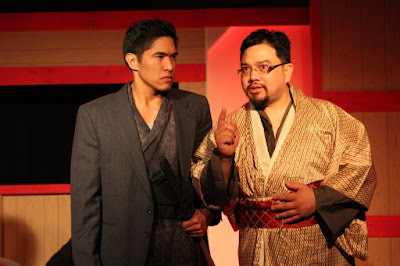 Musical director Daniel Yokomizo handles the difficult score with a delicate touch and capitalizes on the vocal eloquence of the cast’s ringer, Gibran Mahmud, whose cascading tenor voice bounces brilliantly off the surrounding wood panels. The acoustics of the theatre are quite good, even without mics, making it unnecessary for cast members to push (although a couple of the men fall into this trap in their eagerness to communicate during moments of heightened emotion). The story of Commodore Perry’s intrusion into Japan’s tranquility in order to open up the country for trade resonates like Pandora’s box – once the contents have been released they can never be put back. As the ceremony of life begins to unravel and priorities shift to make room for the West’s enticing commercialism, the resulting compromises become increasingly more disturbing. Sondheim’s final two numbers, “Pretty Lady” and “Next” are unsettling for completely different reasons but have as much in common with today’s issues of aggression, resistance, and progress as they did in these circumstances depicted in 1853. Pacific Overtures is some of the best work Chromolume Theatre has done to date. The production strikes a balance between economy of storytelling and dramatic effect to create a uniquely memorable experience. And while it may not be perfect, its level of sophistication is truly admirable.